Meet Casambi, your personal wireless lighting solution that does all of the thinking for you. Casambi provides the most robust, cost effective and future-proof wireless lighting control solution. The system is intuitive and the idea is simple - reduce the need for control cables and give users the ability to change the ambience with technology that is readily available. The system itself is self healing and is able to go offline and catch up with others when they return back online - all the intelligence is replicated, leaving no single point of failure . An internet connection is not necessary, unlike other traditional smart systems. Bluetooth Low Energy is readily accessible for everyone on every device, so communication between the user and network can be done without gateways. The system is intuitive. Connect and pair with a mobile device. No other configuration by a professional technician is required. And did we say, no bridges and gateways here. “Yes, there's a button to press and yes, there's a group of light fittings doing what's required of them, but the entire system is the operating system. This is called wireless mesh network. Imagine a hairnet made of tiny computers on your head...and see the future." Different tasks require different lighting, whether you are working in an office or spending time in your home. Instead of having "accidental lighting", control your lighting to fit a purpose. The Casambi solution is practical for daily use, easy to install and you can share your network with your family or with your colleagues. The Casambi lighting control system is also delightful to use. 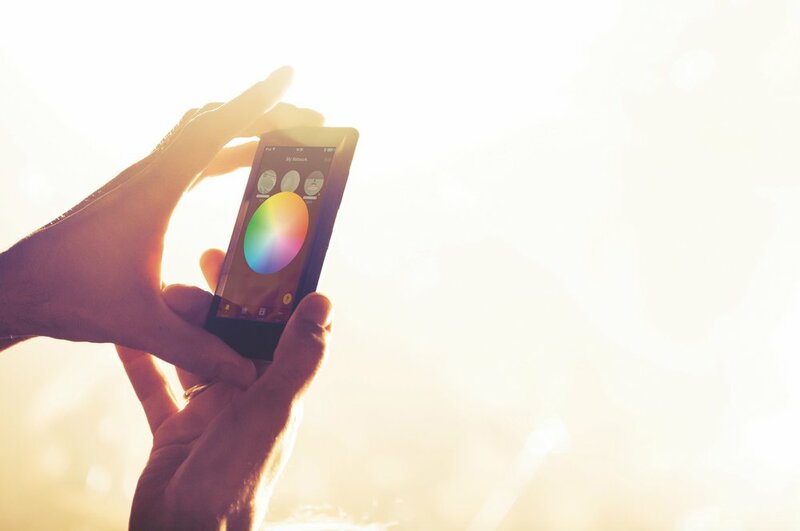 You can change your ambiance according to your mood by dimming, changing the colour of the light, or adjust the colour temperature according to your daylight conditions. Make lighting an experience.